We drove thru on Friday afternoon with the handy advantage of Brother Swoop smsing us the gps co-ordinates of any up-coming speed traps (it's really the preferred way to drive!). Got to the farm after the sun had set and enjoyed a braai with everyone. Saturday saw us all piling into the back of their farm-bakkie and driving out to check on the now pregnant buck and show off the newly acquired farm across the road :) It's beautiful, although burnt. The rest of Saturday was very lazy and spent watching Series (mostly Numbers) and reading our books. Sunday was pretty overcast and windy so Varen & I decided to head into Clarens. I've decided I have no need to venture there again. It always seems like a nice idea, but the shops are terribly over priced and don't really stock anything I can see myself buying - where's the fun in that? And the lunches are nothing special either. We did have some "fun" driving thru raging fires on our way home tho. Seems like the dry Free State farmland is going up in flames, they really do need some rain! 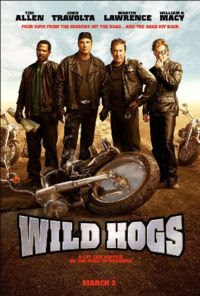 Watched Wild Hogs on dvd this evening. Doug Madsen (Tim Allen), Woody Stevens (John Travolta), Bobby Davis (Martin Lawrence) and Dudley Frank (William H. Macy) are four middle-aged suburban men in Cincinnati who find themselves frustrated with the pace of daily life. Woody is a formerly rich businessman who now finds himself alone and bankrupt. Doug is a dentist who can’t connect with his son and misses his college glory days when he was called “The Golden Knight.” Bobby is a plumber who’s often bossed around by his wife while trying to follow his dream by writing a plumbing how-to book. Dudley is a computer nerd who seeks to find a woman in his life. Their one collective hobby has always been to ride together on motorcycles around the city because after college they stopped being your "typical" biker gang. They even have leather jackets with their biker gang name, “Wild Hogs,” stitched on the back. The movie was very light entertainment. It took a lot for me to watch it since I simply can not bear Tim Allen, but I was curious to watch it none the less. Sheer disappointment and a waste of my time, really. I've been to Clarens a couple of times myself. Apart from the farm our friends out there own, with gorgeous baby lambs in spring, I must agree with you - it's best appreciated through avoidance!